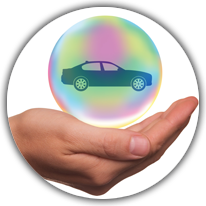 When you purchase a new or used vehicle, there are many coverage options to choose from. Listed below are some of the coverage options that may be mandated by each state in order to license your motor vehicle. Property damage covers the damage you cause to another vehicle or property of others (mailbox, light pole, house.) Property damage coverage is purchased in conjunction with bodily injury coverage. Each state has a minimum limit of property damage you have to purchase. Examples of comprehensive coverage include: theft of your vehicle, hitting a bird or deer, glass breakage, vandalism, fire and water (flood). If you have a loan or are leasing your vehicle, you will be required to have comprehensive coverage. Deductible options can be as low as zero up to $5,000. Repairs or replacements to the windshield or other glass on your vehicle without a deductible. This coverage is not available in all states. Provides a dollar per day stipend for a covered vehicle under your automobile policy that is being repaired or replaced due to damage for a loss covered under comprehensive or collision coverage. You may be able to choose your rental reimbursement per day stipend when you purchase your automobile policy. Will cover the cost to have your vehicle towed to the nearest facility for assistance. This can also be called roadside assistance. Why should I carry higher limits than the minimum liability limits set out by my state? If you have assets you need to protect, you should consider higher liability limits. Higher liability limits will protect you from lawsuits by person or persons you may injure in an accident. You want to protect your financial assets. Will my automobile policy provide coverage for a teenager who does not have a driver’s license or a relative visiting from out of town while using my vehicle? You have to give permission to anyone who drives your vehicle (as long as the person is not an excluded driver under your policy). However, you would need to review your policy in the event some situations are excluded. I have a trailer that I pull with my vehicle. What type of coverage do I have? Usually the liability for the trailer will be extended from the vehicle hauling the trailer. If you would like comprehensive and collision coverage for the trailer, you will need to purchase the coverage. If I purchase a private passenger automobile that replaces my current private passenger automobile, what type of coverage do I have on the new vehicle? The new private passenger automobile would have the same coverage as the vehicle it is replacing. Contact your insurance carrier as soon as possible to notify them about the new vehicle. Will my personal automobile policy provide coverage if I am using my vehicle in business? Consult your insurance company or agent to determine if your personal automobile policy provides coverage for your vehicle for business use. If I rent a moving truck to move my personal property, do I have coverage under my automobile policy for the rental truck? Most personal automobile policies will not provide coverage for the rental truck. For illustration purposes, we are showing the following automobile liability limits for the claims examples. There is a three-car rear end accident. The insured rear ended the middle vehicle which was pushed into the front vehicle. There are minor injuries to our insured and the other parties. The claim will settle for around $30,000 for bodily injury. The insured ran a red light and struck the other party in an intersection. There are minor injuries to the insured and to the other party. The claim is settled for approximately $50,000. Uninsured/Underinsured Motorists—The insured had a limit of $100,000 and was rear ended by an uninsured drunk driver. The insured suffered a leg injury which required surgery and physical therapy. The uninsured motorist coverage on the automobile policy was sufficient. The insured ran over a pedestrian in a cross walk. The pedestrian was a young female attorney who suffered significant pelvic and internal injuries. She was recently married and wanted children. The claim is still pending, but they are asserting over $6 million in damages. The insured made a left hand turn across traffic and collided with a motorcycle with a passenger. Both people on the motorcycle suffered significant orthopedic injuries and amassed in excess of $600,000 in medical bills. The court settlement was in excess of $3.5 million. Dwelling is your home. The dwelling would also include any structure attached to your home such as a garage or fence. Other Structures are not attached to your home. Examples of other structures are pools and storage sheds. This includes but is not limited to appliances, clothing, furniture, TVs, computers, and other household items. If a covered loss makes your residence uninhabitable, the insurance company will cover any reasonable increase in living expenses incurred by you to maintain your normal standard of living. The amount of this coverage will vary between insurance carriers. Personal liability provides coverage for bodily injury and property damage sustained by others in which you are legally responsible. Medical payments are the necessary medical expenses for an accident causing bodily injury up to a limit listed on the declarations page on your premises. The deductible applies to a covered loss to your dwelling, other structures and/or personal property. Deductibles can vary between $500 and $5000. You would be responsible for your deductible for a covered loss so you choose your deductible based on your comfort level. You pick a deductible when you request your homeowner’s policy. 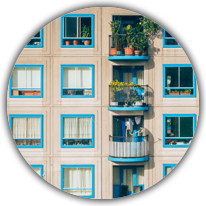 Many apartment complexes are now requiring tenants to purchase renters insurance. 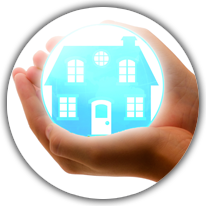 Renters insurance covers your personal property and personal liability. Personal property includes but is not limited to clothing, furniture, TVs, computers, and other household items. The deductible applies to a covered loss to your personal property. Deductibles can vary between $500 and $5000. You would be responsible for your deductible for a covered loss so you choose your deductible based on your comfort level. You pick a deductible when you request your homeowner’s policy. For illustration purposes, are using a $100,000 personal liability limit for the claim examples below. A toilet overflowed into the apartment below, causing water damage. The damages were $60,000; therefore the claim could be paid with no limit issues. A neighbor came over to borrow flour from the insured. There was water on the floor in the insured’s unit and the neighbor slipped and fell, breaking her hip. The neighbor had to undergo surgery and was in the hospital for two weeks, plus eight weeks of physical therapy. Medical costs for the neighbor were over $250,000.